While giving a recent tour of the Magic Kingdom, I found myself in Adventureland shortly after park opening. 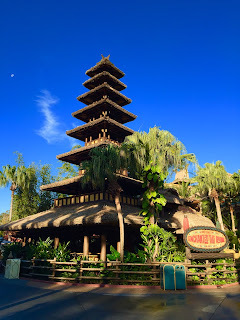 I was able to get this clear shot of Walt Disney's Enchanted Tiki Room from the area in front of Jungle Cruise. Although the Tiki Room may not be the most "exciting" attraction, it is an entertaining show with historical significance.